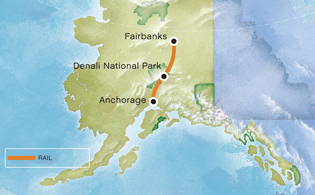 Explore Alaska on this unforgettable adventure that originates in the Golden Heart City of Fairbanks and takes you through Alaska’s ruggedly beautiful Interior aboard a luxury glass-domed railcar to Denali National Park and the city of Anchorage. With ample time to explore some of the six million acres of wilderness in Denali, you will have the opportunity to take part in activities such as flightseeing excursions, ATV adventures and fly-fishing tours. Enjoy dinner and a show at the Music of Denali Dinner Theater at McKinley Chalet Resort featuring family-style dining and a spirited original musical about the first men to reach the summit of Denali. You will explore the park on the Tundra Wilderness Tour and have a chance to see some of the park’s wildlife including bears, moose, caribou and wolves. The tour ends in the state’s largest city of Anchorage where you will take a day trip to Portage Lake and cruise within 300 yards of the actively calving Portage Glacier. Culture, adventure and wilderness await you on this tour that showcases Alaska’s majestic beauty. Transfer from the airport to your hotel and spend the day exploring Alaska’s Golden Heart City. Fairbanks is a thriving city on the doorstep of the expansive Alaska wilderness. Surrounding tundra and the looming Mount McKinley provide an incredible backdrop for learning more about the rich gold rush past and Alaska Native culture of this unique community. Visit the tour desk at your hotel to book an optional excursion such as a visit to the nearby Chena Hot Springs that is world-famous for its healing mineral waters. Overnight in Fairbanks. Spend the morning on your own, relaxing or shopping for souvenirs at some of the many gift shops outside of the park. Later, board the train for another enjoyable and awe-inspiring ride through the Alaska wilderness, including a crossing over the dramatic Hurricane Gulch bridge. Enjoy a unique dining experience onboard the train as you take in the view before arriving in the state’s largest city of Anchorage. Overnight in Anchorage. Enjoy a day trip to nearby Portage Lake where a memorable glacier cruise aboard the mv Ptarmigan awaits. Observe the actively calving Portage Glacier from 300 yards away and marvel at the blue ice crashing into the water below. From a fully enclosed heated cabin, learn more about the glacier and the history of the area as you cruise with an onboard representative of the U.S. Forest Service. Afterward, visit the Alaska Wildlife Conservation Center where injured and orphaned animals live year round in spacious enclosures, receiving quality care. Get up close and personal with moose, brown bears, black bears, caribou, musk ox and lynx, among others. Enjoy a relaxing evening in Anchorage and overnight. Spend your last morning in Anchorage strolling on the Tony Knowles Coastal Trail or enjoying a hearty breakfast at one of the popular downtown eateries. Later, transfer to the airport where you will end your Alaska vacation and wave farewell to the Last Frontier.